Bed bugs have become the scourge of the pest population due to their dining habits, which include human blood. 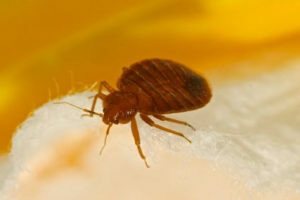 At one time, bed bugs were a more dormant species but in recent years, this mobile bug has become more problematic for cities around the world. This is due, in part, to more people traveling and the bed bugs stowing away in their luggage. If you ask any NJ pest control professional what the easiest way is to get rid of bed bugs using over-the-counter sprays, they’ll tell you there isn’t a bug spray that’s going to eliminate the bloodsuckers. Recently, researchers at North Carolina State University conducted tests involving boric acid. The tests were by ingestion and by an external covering of boric acid dust. The results concluded that when boric acid was ingested by the bed bugs, they expired quickly while the bed bugs that were subjected to a high dose of boric acid externally were minimally affected. Their goal was to find a way to design an easy-to-use bait system based on boric acid to attract and eliminate bed bugs. In the meantime, if you’re seeing signs of bed bugs, such as stains on bedding as well as red itchy welts on your body, or if you just want to have your home checked, contact Stern Environmental for an inspection by an experienced NJ pest control specialist. Handling bed bug infestations promptly is highly important, but it also needs to be done safely to prevent harm to homeowners or building occupants. Bed bug control that involved the use of heat led to the death of one Houston woman. A Houston couple returned to their home in Laure Point Senior Apartments after it had been treated for bed bugs. Shortly after entering their home, the couple had to be taken to the hospital for emergency care. The treatment that was used to kill bed bugs raised the temperature inside the home to 139 degrees. The wife, 82-year-old Elizabeth Ashbaugh, ended up passing away at the hospital. Her family is suing the landlord and pest control company for failing to let the couple know when it would be safe to return home. This unfortunate story illustrates the need to ensure that bed bug infestations are dealt with as safely as possible. At Stern, we use freezing technology to get rid of these pests. This helps prevent the kinds of health risks that are associated with the use of heat or chemicals to eliminate bed bugs from homes and businesses. If your home or business has bed bugs, make sure it’s handled safely and properly. At Stern Environmental Group, we offer safe and dependable bed bug control to eliminate infestations without endangering you and your family or tenants. Are Bed Bugs Getting Stronger or Are More People Coping With This Annoying Pest? Everyone knows that New York City is prime territory for bed bugs. When it comes to bed bugs in apartment buildings, one would assume that NYC bed bug specialists would be called right away to deal with the problem. In the case of one woman living in the Bronx, exterminators were called, but she was told to stay in the apartment as bed bug bait. If you’ve ever dealt with bed bugs, you know that your first order of business is to get out and let the professionals handle it. You don’t want to stay in a place where you’re being bitten, and suffer psychological damage as a result. Why would a housing manager tell the woman to stay in the apartment with her infant son after it was treated with chemicals? He had already suffered many bites, some of which allegedly left scars. The woman’s spouse did stay in the apartment, and it was discovered that the chemicals didn’t work. Many would say that this woman does have a solid basis for her lawsuit. However, what she really needs is the help of NYC bed bug specialists who can take care of the problem the right way. At Stern, we know that chemicals aren’t always effective because bed bugs have adapted to them. We use the best methods for proper bed bug elimination. Contact us! Red itchy spots, swollen itchy areas, raised red welts, or rashes can appear on any part of the body. Even allergic reactions for some people are what you can expect when bed bugs invade your home. These tiny bloodsuckers aren’t particular about where they bite to satisfy their hunger. In their eyes, you are a large and welcoming buffet. 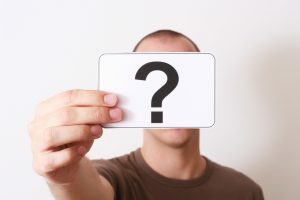 Visit our website and our frequently asked questions page about encasements and covers for box springs and mattresses to protect you against bed bug bites. With our Protect-A-Bed covers and encasements, everyone will get a good night’s sleep without the worry of becoming a midnight entree or snack for foraging bed bugs. The covers are professional grade and they’ve been certified as being bite-proof. The BugLock® zipper protection provides the added security of a bite-free sleeping environment. Both products have been tested and certified in a laboratory environment by experts and created by those who know what it takes to treat, remove and eradicate a bed bug infestation. Take a tip from our knowledgeable staff and protect your current bedding or new bedding with these two innovative products. 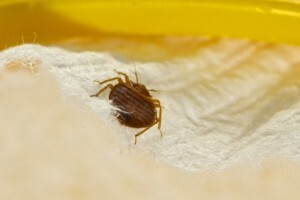 For more information, give us a call and speak with one of our NYC bed bug specialists. Our chat service is also available with a live associate ready to answer questions and set up an appointment for a bed bug inspection by our trained NYC bed bug specialists.